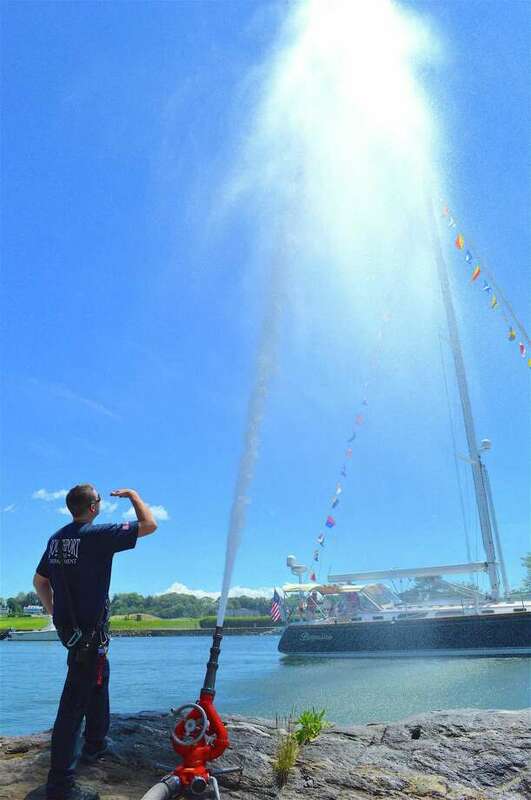 Firefighter Jay Hayes oversees the firehose as the ship "Beguine" passes through the harbor during the annual Blessing of the Fleet in Southport Harbor, Saturday, June 24, 2017, in Fairfield, Conn.
FAIRFIELD — Sailing season officially got underway Saturday afternoon with the Blessing of the Fleet at the lower wharf in Southport Harbor. Following a parade from Southport Congregational Church, local clergy said prayers over around 50 seafaring vessels, which exited the harbor under a baptism-like spray of water projected 40 feet in the air from a fire house. “This is indeed a really magical event, where the community comes together,” said U.S. Sen. Richard Blumenthal, who joined other officials, including U.S. Sen. Chris Murphy and U.S. Rep. Jim Himes. “It is really a very sweet ceremony in the best sense,” he said.